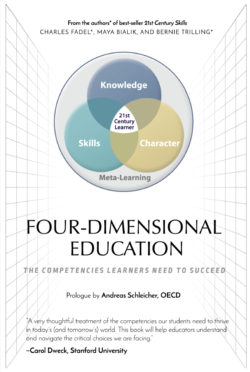 The Competencies Learners Need to Succeed," by Charles Fadel, Bernie Trilling and Maya Bialik. The following is from the section, "Metacognition—Reflecting on Learning Goals, Strategies, and Results." Metacognition, simply put, is the process of thinking about thinking. It is important in every aspect of school and life, since it involves self-reflection on one’s current position, future goals, potential actions and strategies, and results. At its core, it is a basic survival strategy, and has been shown to be present even in rats. 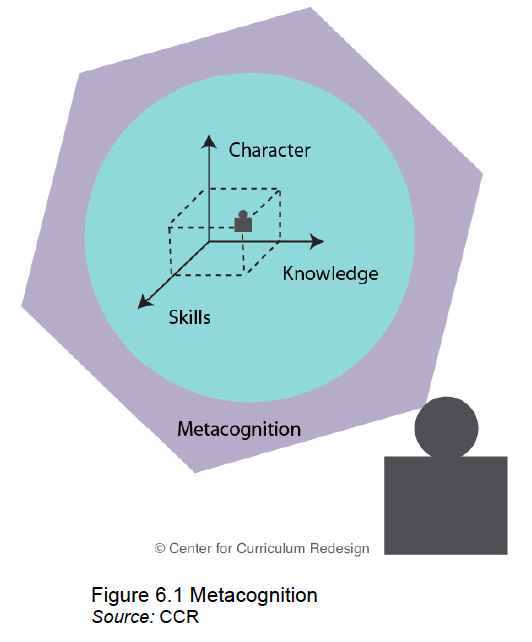 Perhaps the most important reason for developing metacognition is that it can improve the application of knowledge, skills, and character qualities in realms beyond the immediate context in which they were learned. This can result in the transfer of competencies across disciplines—important for students preparing for real-life situations where clear-cut divisions of disciplines fall away and one must select competencies from the entire gamut of their experience to effectively apply them to the challenges at hand. Even within academic settings, it is valuable—and often necessary—to apply principles and methods across disciplinary lines. Transfer can also be necessary within a discipline, such as when a particular idea or skill was learned with one example, but students must know how to apply it to another task to complete their homework or exams, or to a different context. Transfer is the ultimate goal of all education, as students are expected to internalize what they learn in school and apply it to life. 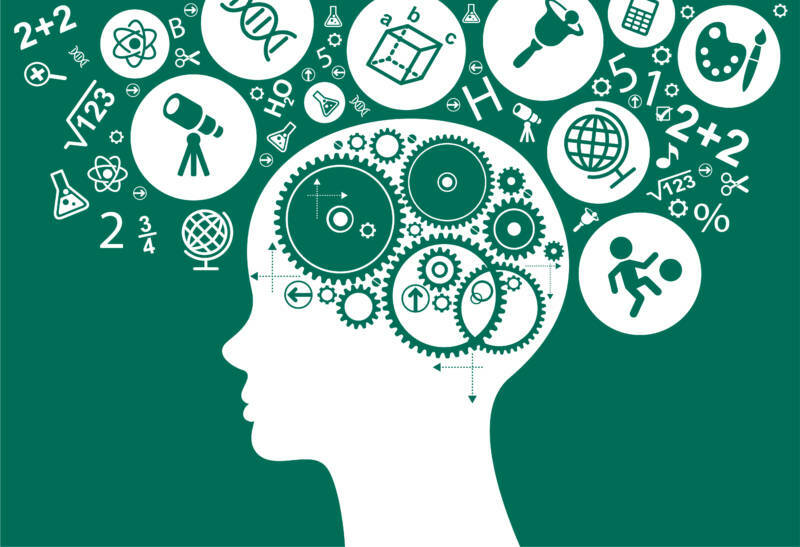 To illustrate the value of metacognition and how it actually plays a role in learning, we can consider an example from mathematics, where it has been shown that metacognition plays a central role in learning and achievement. Specifically, when novice students were compared to seasoned mathematicians, the students selected a seemingly useful strategy and continued to apply it without checking to see if the strategy of choice was actually working well. Thus, a significant amount of time was wasted in fruitless pursuits. The more experienced mathematicians on the other hand, exercised metacognition, monitoring their approach all along the way to see if it was actually leading to a solution or merely to a dead end. Being aware of how one is engaging with the process of learning influences how the student interprets the task at hand, and what strategies are selected and employed in service of achieving learning goals. It can help optimize the problem-solving experience at a very high level, and is thus applicable across a large range of contexts. These metacognitive strategies are powerful tools for any discipline, inter-discipline or for learning in general. Of course, with such an abstract learning goal, it is important for educators to be precise with how they teach it. Traditional methods for improving students’ learning strategies often focus on prescribed procedures (note-taking, self-testing, scheduling, etc.) and typically result in initial motivation and some short-term improvement, but ultimately a reversion to old habits happens. While these tactics may work in the short term (e.g., to cram for an exam), once the context changes, successful transfer of these methods is less likely to occur. More strategic methods that focus on metacognition for deeper learning— such as developing a growth mindset (discussed later), setting and monitoring one’s learning goals, and growing one’s capacity to persist despite difficulties—have been shown to result in more permanent learning gains. Metacognition can be developed in students in the context of their current goals and can enhance their learning of competencies as well as transfer of learning, no matter their starting achievement level. In fact, it may be most useful for lower-achieving students, as the higher-achieving students are already employing strategies that have proven successful for them. For learning disabled and low - achieving students, metacognitive training has been shown to improve behavior more effectively than traditional attention-control training. Students who have higher levels of self-efficacy (more confidence in their ability to achieve their goals) are more likely to engage in metacognition and, in turn, are more likely to perform at higher levels. This strongly indicates a positive feedback loop for high-achieving students—they are more successful by using metacognitive strategies, which increases their confidence and in turn leads them to continue to increase their performance. Metacognition is an integral part of this virtuous learning cycle, and one that is amenable to further improvement through instruction. Charles Fadel is founder of the Center for Curriculum Redesign, Bernie Trilling is founder of 21st Century Learning Advisors and Maya Bialik is researcher at CCR.